Download "Domain Name Assignment Agreement"
1 Agreement Document 4041A Access to this document and the LeapLaw web site is provided with the understanding that neither LeapLaw Inc. nor any of the providers of information that appear on the web site is engaged in rendering legal, accounting or other professional services. If you require legal advice or other expert assistance, you agree that you will obtain the services of a competent, professional person and will not rely on information provided on the web site as a substitute for such advice or assistance. Neither the presentation of this document to you nor your receipt of this document creates an attorney-client relationship. 2 DOMAIN NAME ASSIGNMENT AGREEMENT This DOMAIN NAME ASSIGNMENT AGREEMENT is entered into this day of, 20 (the Agreement ) by and between [NAME OF TRANSFEROR], [a corporation, having a principal place of business at ] [an individual residing at ] ("Transferor") and [NAME OF TRANSFEREE], a corporation, having a principal place of business at ] [an individual residing at ] ("Transferee"). 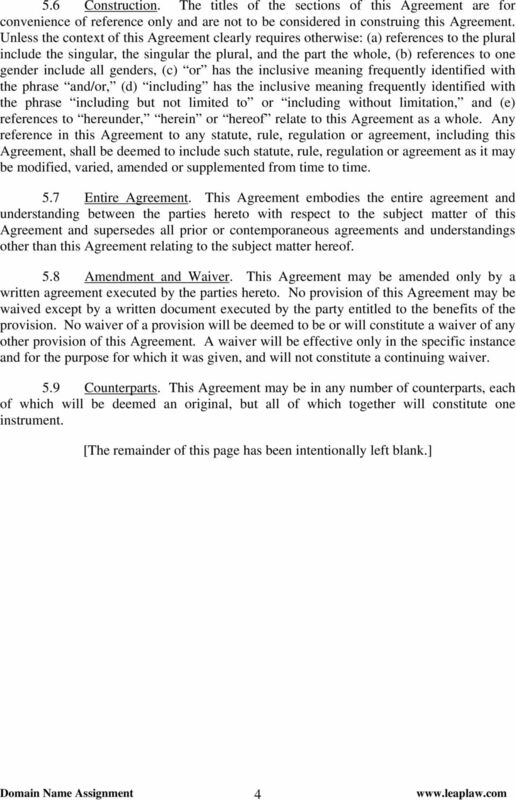 WHEREAS, the Transferor has adopted, used and registered with [NAME OF DOMAIN REGISTRY] the domain name [ ] (the "Domain Name"); WHEREAS, the Transferee is desirous of acquiring the Domain Name and the registration therefor; NOW THEREFORE, for good and valuable consideration, receipt of which is hereby acknowledged, Transferor hereby transfers and assigns to Transferee all of the Transferor's right, title and interest in and to the Domain Name and the registration thereof. The Parties agree as follows: 1. 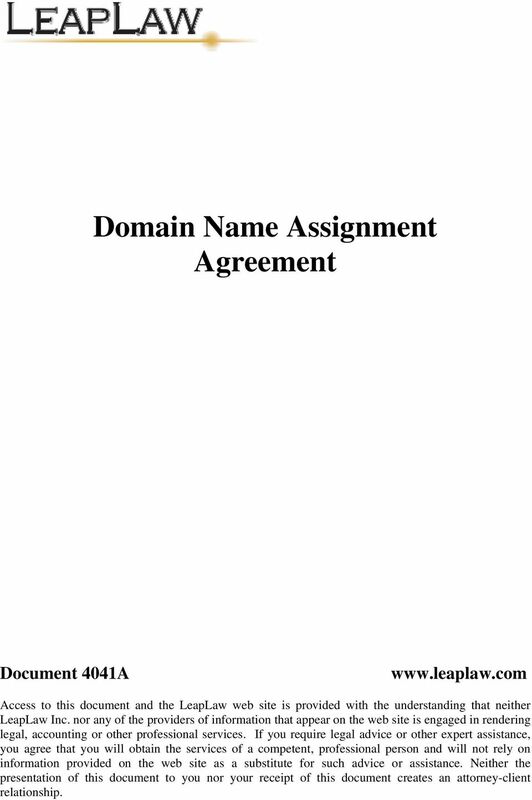 Assignment of Domain Name. Transferor hereby transfers and assigns to Transferee all right, title, interest and goodwill in or associated with the Domain Name together with any unregistered or registered trademarks, service marks, copyrights or other intellectual property or proprietary rights based on or in any way related to the Domain Name. 2. Consideration. 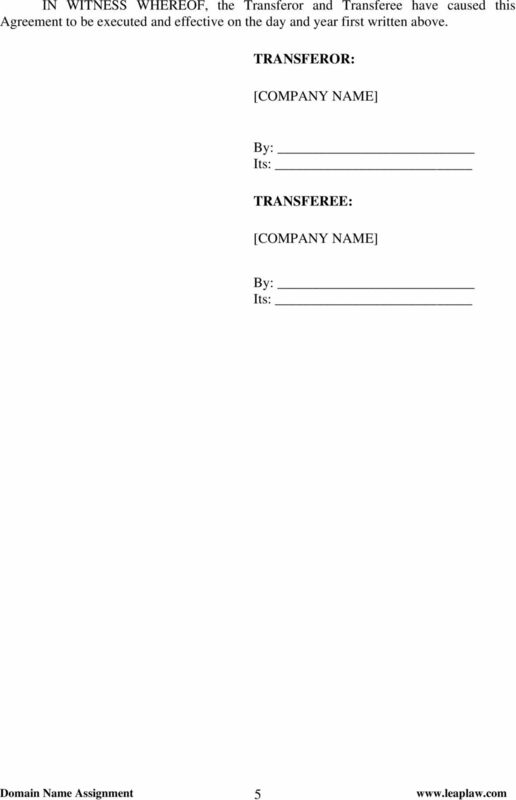 In consideration of the assignment of the Domain Name, Transferee agrees to pay Transferor the sum of Dollars ($ ), payable in U.S. currency [upon execution of this Agreement] [upon completion of the transfer of the Domain Name]. 3. Effectuate Transfer. Transferor agrees to cooperate with Transferee and to follow Transferee's instructions in order to effectuate the transfer of the Domain Name registration in a timely manner. 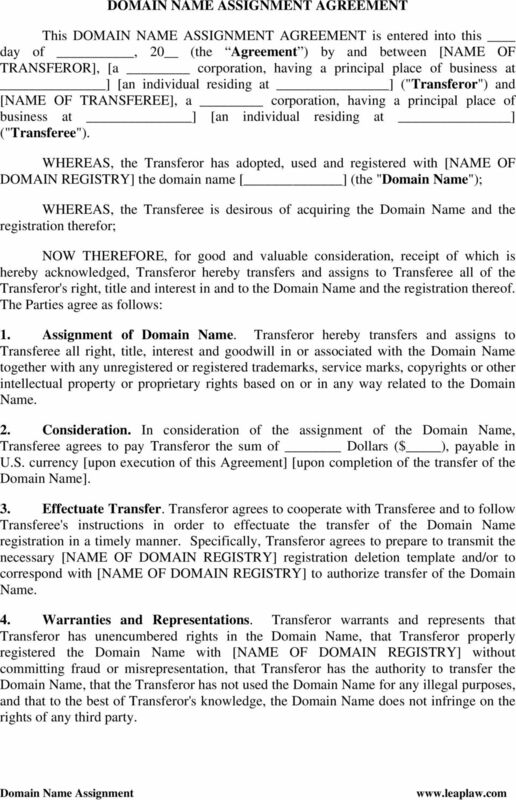 Specifically, Transferor agrees to prepare to transmit the necessary [NAME OF DOMAIN REGISTRY] registration deletion template and/or to correspond with [NAME OF DOMAIN REGISTRY] to authorize transfer of the Domain Name. 4. Warranties and Representations. Transferor warrants and represents that Transferor has unencumbered rights in the Domain Name, that Transferor properly registered the Domain Name with [NAME OF DOMAIN REGISTRY] without committing fraud or misrepresentation, that Transferor has the authority to transfer the Domain Name, that the Transferor has not used the Domain Name for any illegal purposes, and that to the best of Transferor's knowledge, the Domain Name does not infringe on the rights of any third party. TRADEMARK AND DOMAIN NAME AGREEMENT This agreement (the Agreement ) is by and between _ ( Party ) and Eclipse Foundation, Inc. ( Eclipse ) and is effective as of [ ] [ ], 201[ ] (the Effective Date ). 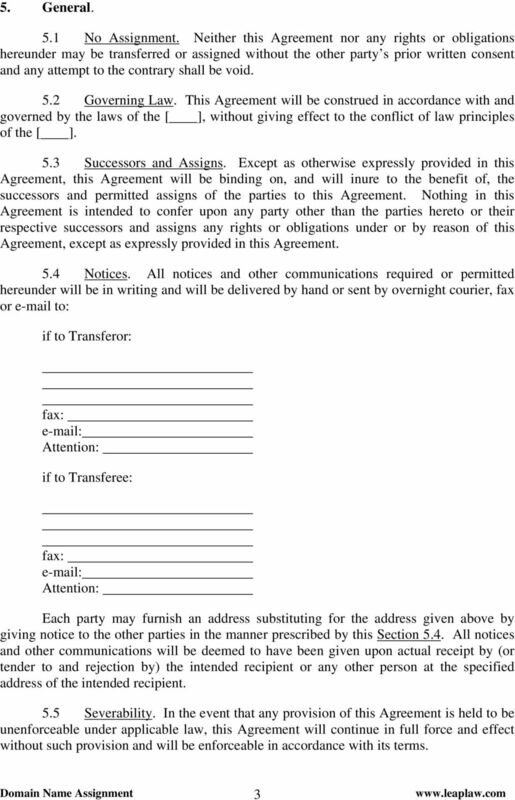 Marketing Agreement 3. TRACKING OF USERS.